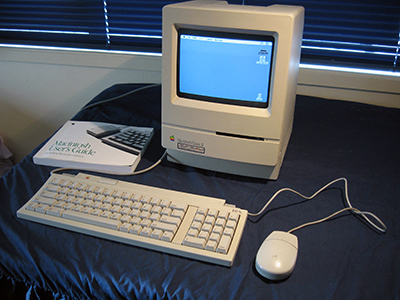 Less capable and expandable than the SE/30, the Classic II actually appeared later that the latter, being last of the Baby Mac line, excluding her other namesake which came with colour. Also known as the Performa 200, the model is equipped with a 16 Mhz Motorola 68030 CPU but only a 16 bit data bus which cripples it somewhat. My unit has an 80 MB hard drive and 10MB RAM. It came to me from a school, an environment where these models were quite popular. It was in good condition when it arrived, although its software was locked up with a school security program so access to the OS was impossible. The password had long been forgotten. However, its past life was soon washed out of it with a complete re-format and re-installation. This unit, like all Macs of this vintage, has exhibited problems from leaky capacitors. I tried a couple of temporary solutions such as washing the mainboard in a dishwasher, and cleaning around the capacitors with cotton buds (Q-tips). These worked for a while but eventually the problems returned. Finally I bit the bullet and replaced the offending components. It now works just fine. Cute and in really good nick, it has a manual and loads of software now on the hard disk. Being an MS-DOS/Windows man, I still find Mac OS confusing. Not to use, but in figuring out how to get to the core of the beast. A lot is hidden from the user. This is probably a good thing in some cases, but I like to know how my micros tick.